I had some vanilla crème fraîche and no idea what to use it for, and then I noticed some overripe bananas over on the counter. Inspiration! 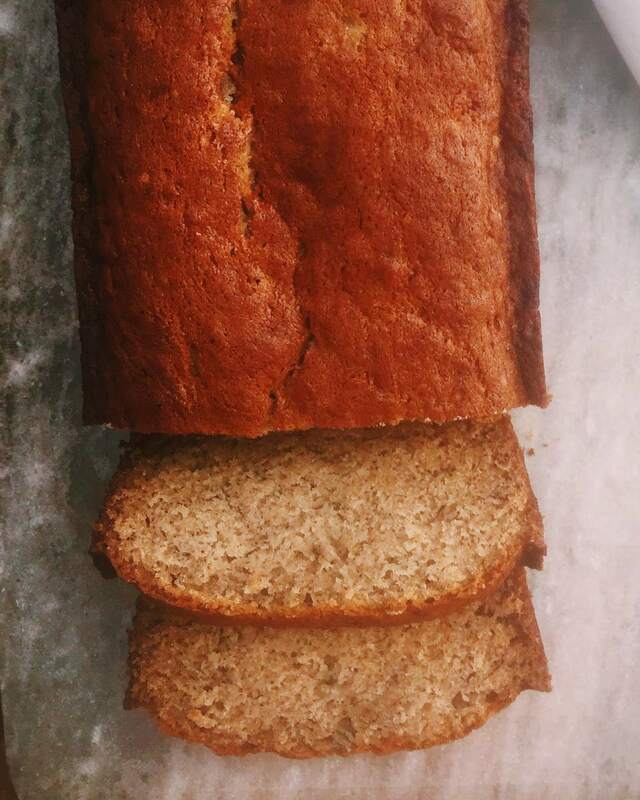 Homemade banana bread does come together very quickly, and it’s hard to imagine a homier snack or treat or brunch offering. And the vanilla crème fraîche (available in well-stocked supermarkets, cheese stores, or buy online) added both a pronounced vanilla bean flavor and a tangy moistness that made this banana bread very special. You can use a standing mixer, but if you do, use the paddle attachment, and do not over blend. Over blending quick bread batters results in tough breads and muffins. You want to barely still see faint streaks of flour and squished banana. I love nonstick cooking sprays when I am baking. Greasing cake pans and muffin tins and (particularly) muffin tins has always been one of those kitchen tasks I find a bit odious, and a hefty spray of nonstick cooking spray does the job pretty well, in most cases. Also, for cakes and other baked goods, there are some sprays that actually have the same effect as buttering AND flouring a pan. Preheat the oven to 350°F. Spray a 9x5-inch loaf pan with nonstick cooking spray. In a small bowl, mix together the flour, baking soda, cinnamon and salt. In a large bowl with an electric mixer, beat the butter and sugar until lightly and fluffy, about 3 minutes. Beat in the eggs one at a time. Blend in the mashed bananas and crème fraîche. Bake for 40 to 45 minutes until a wooden skewer inserted into the middle comes out clean. Let it sit in the pan on wire racks for 10 minutes, then gently turn the bread out of the pan, and cool it upright on a wire rack. Eat warm or at room temperature. You can bake the batter in muffins tins that have been sprayed with nonstick baking spray, and lined with muffins liners. Bake for about 23 to 25 minutes. Cool in the pan on a wire rack for 10 minutes, then turn the muffins out of the pan and finishing cooling them upright on the wire rack. Make Ahead Tip: This bread will last in a tightly sealed container for up to 3 days without drying out much, thanks to the bananas and dairy. Spray the pan with nonstick spray, mash the bananas (if you have an old-fashioned potato masher this becomes much more fun; if not use a fork), measure the ingredients, crack eggs, stir, scoop batter into the pan.